The hall was built as a soup kitchen in Victorian times and later acquired by the Church of Scotland, when it became known as the Church Hall or the Mission Hall. Up to the late 1970s it was used along with the much larger Volunteer Hall in what is now the Old Town. The Volunteer Hall was sold and demolished to make way for new housing in the 1970s. At the same time, the new AytonPrimary School was built which included a large hall to be used as a community hall. The school hall was used well for 20 years or so but greatly increased hire charges have meant it is rarely used by the community now. This is a photo of the hall as it was, before the refurbishment, looking its very best, set out for a meal, organised by the SWRI. 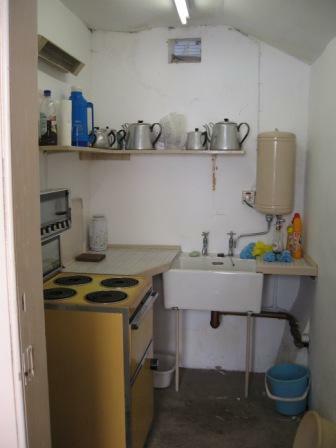 The tiny kitchen was behind the hatch between the two doors. The hall was always cold and difficult to heat in the winter. It had absolutely no insulation whatsoever. Originally it had gas lighting and had two open fires in the main hall as the only source of heating. There was another fireplace in the back room, which later became the library and second hand bookshop. This is what the old kitchen looked like. We aren’t exactly sure when the hall was built. 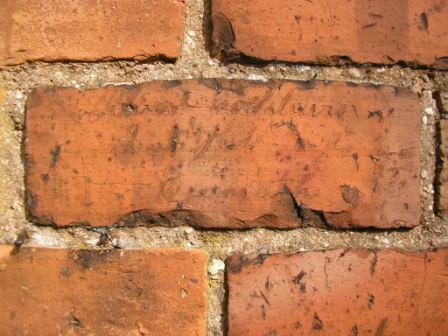 When we were looking at the outside bricks prior to the refurbishment work we found this brick on the south side of the hall. It is engraved Robert Cockburn, Lint Hill, Eyemouth. Unfortunately there’s no date on it. We know from that that the bricks used to build the original came from the tile and brickworks at Linthill on the back road to Eyemouth. We investigated further after finding this but could find no local records for Robert Cockburn. 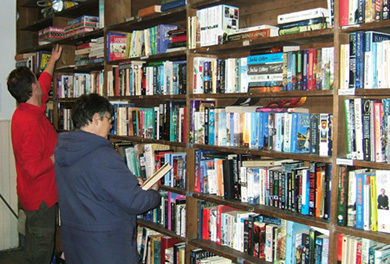 The ACHA second hand bookshop operated from 2006 to 2009, raising nearly £2000 to help the hall refurbishment. It was open on Saturday mornings and was well supported for a while. The area where the bookshop was in the old back of the hall is where the new kitchen is. 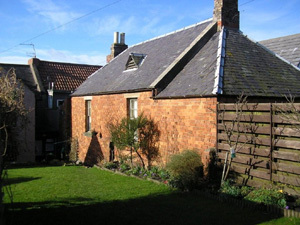 In times past this small room was the Berwickshire county library branch in the village. It was always damp! 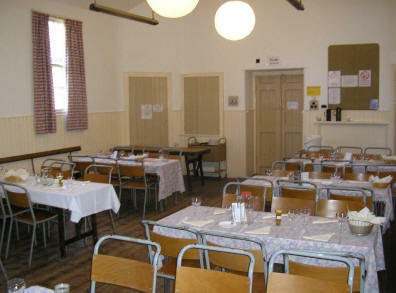 This is the hall before the refurbishment.